And we thought Steppinstone Bridge was bad! A pedestrians’ foot bridge has been left without lights for five years because repairs have been delayed for safety reasons. Hampshire County Council said it was waiting for permission from Network Rail to carry out the repairs. 25 May 2012 – Despite several online complaints, a full council motion by SHDC and a number of letters, with the last one being special delivery to the chief executive, nothing has changed since 16 March. A phone call from them today has now promised that the work will take place on Thursday of next week. I have also now written to Grantham Magistrates’ Court, asking for advice on how to obtain a Litter Abatement Order against Network Rail. A bit more information for residents regarding the flooding problem the bridge suffers during periods of heavy rain. Below is a link to a letter received from LCC. As you will see from reading this, the issue of who does what on the bridge is far from straightforward. I will do my best to make progress on this before the freezing weather arrives again this year. Minor progress of sorts on the lighting issue, although sadly no actual light at the end of the tunnel, because it still doesn’t work! At least I now know that it is a waste of timing asking either Network Rail or LCC to fix it. 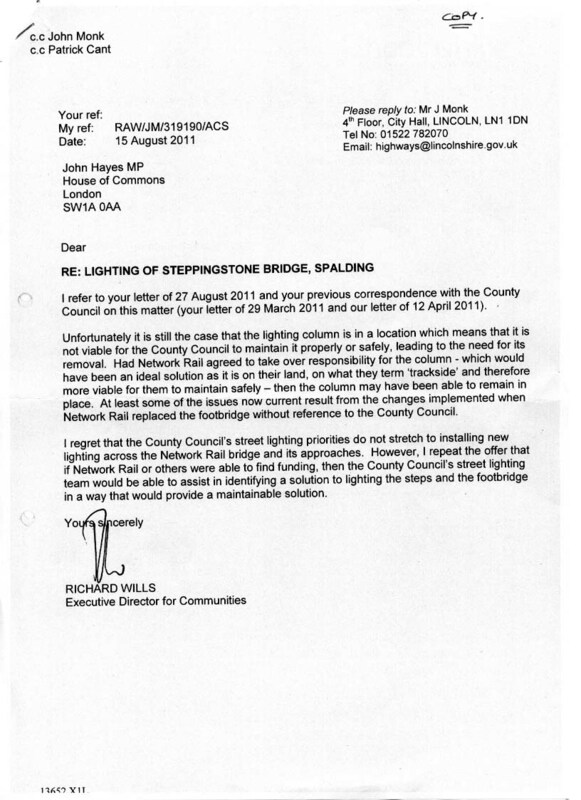 I received a letter from LCC today, giving me some information on the situation regarding the lack of a working light on the bridge. It would seem that, despite being the county council and actually having responsiblity for the footpath that crosses the railway line via this bridge, LCC can’t get any more sense out of Network Rail than the rest of us. It’s difficult to believe that a company that relies so heavily on public money for its survival, can be so arrogant when it comes to addressing the concerns of members of that public. Below is a copy of the letter I received today along with one sent to John Hayes MP. 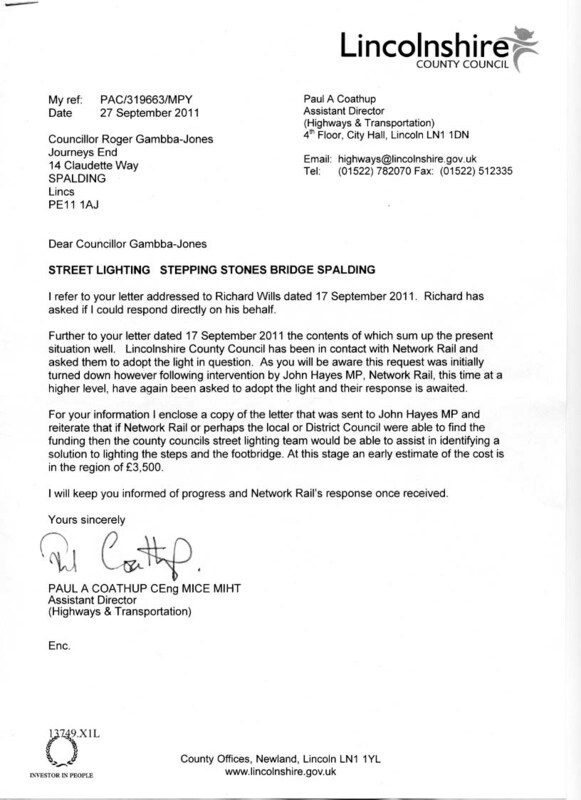 Bottom line is, if I can find £3,500, the county council is willing to install and maintain lighting on the bridge. I will now be seeking some support from other Spalding members at the next Spalding Town Forum. This support could be by tapping in to the ward budgets, or maybe by seeking some help from the Spalding Power Station community fund. Watch this space.